English weather is a challenge, especially when it snows. At Bedford Girls’ School we feel strongly that the school should stay open despite the weather to ensure we provide education for the girls, as long as they are able to get to school safely. Sometimes our girls take their education for granted; this week I posed to them a number of questions: What if education was banned? What if girls were not allowed to go to school, as is the case in some societies? What would they do to ensure their right to be educated and what would they do to ensure they got to school? I gave them the example of Daisy Mora and the lengths she went to, to ensure that she was educated. Every day Daisy attaches herself and the sack containing her young brother, to a pulley attached to a steel cable 800m in length and 400m above the rainforest canopy. She then sets off on a breakneck 60-second journey to the other side of the canyon and school. A branch in the shape of a wishbone forms a crude brake, which slows them to around 50 miles an hour. This is the school run, Colombian rainforest-style. As she speeds towards the tyre that acts as a buffer on the other side, Daisy hammers at the steel bolt on the pulley to ensure it doesn’t loosen. It grates and sparks, and the wooden brake starts to smoke from the friction. 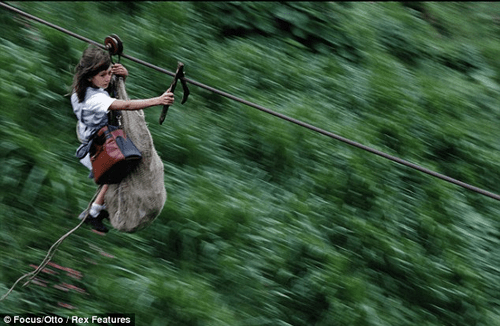 Every day Daisy risks her life to get to school. Whilst none of our girls risk their life to be educated, for many the journey to school is long. Through the winter months when the days are short, they rarely see their home in the daylight, other than on weekends. And whilst many of them secretly hope that the school will close during the snow, when they see examples of girls fighting for the right to be educated they recognise how lucky they are and appreciate the opportunities they have been given.